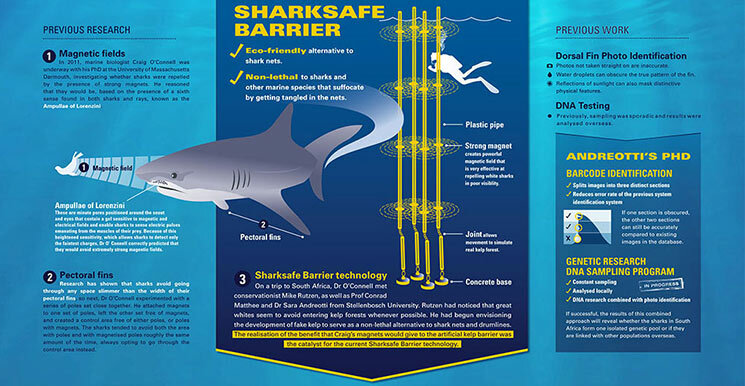 The Sharksafe Barrier is an eco-friendly alternative to the shark nets and baited drumlines that prove lethal to a vast and indiscriminate array of marine life. Hundreds of thousands of sharks, dolphins, turtles and other species die after becoming tangled in the strands of nets, or hooked on drum lines. The Sharksafe Barrier is the result of the collaboration between Dr. Craig O’Connell from the US, Dr Sara Andreotti from Italy, Prof Conrad Matthee of Stellenbosch University and Mike Rutzen, a local conservationist. While doing his PhD at the University of Massachusetts, Craig O’Connell began investigating whether sharks were repelled by large magnets. He had a hunch they would be, based on the presence of a sixth sense found in both sharks and rays. 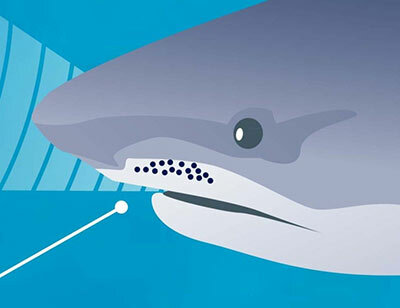 These minute pores around the snout and the eyes – known as the Ampullae of Lorenzini – contain a gel sensitive to magnetic/electric fields. This enables them to sense electric pulses coming from their prey, even in poor visibility. White sharks use the Ampullae of Lorenzini when hunting, as it allows them to sense the position of their prey while keeping their eyes closed – and so protected. Dr O’Connell found that when sharks were confronted with two possible snacks – a fish attached to a brick and one attached to a strong magnet, they tending to choose the former. (O’Connell et al. 2012, 2014). When Dr O’Connell set up two sets of poles – those with magnets and those without – as well as a control area free of either, the sharks avoided each of the poled areas roughly the same amount of the time, always opting to go through the control area instead. On a trip to South Africa, Dr O’Connell met Prof Conrad Matthee and Sara Andreotti from Stellenbosch University, along with Mike Rutzen, and together the team took his ideas one step further. Rutzen has spent infinite hours observing sharks in their natural habitat, and had noticed that great white sharks seemed to avoid kelp beds whenever possible. On the basis of O’Connell’s research and this observation, the team devised the Sharksafe Barrier – a structure made from rigid pipes that emit a magnetic barrier and resemble a kelp bed when erected underwater. The team have been developing the Sharksafe Barrier since 2011, each contributing their areas of expertise and, in some instances, funding. WSDC is also helping to fund this project through various initiatives, including the sale of buffs and the establishment of a volunteer programme. The Sharksafe Barrier is currently in the final phase of testing, and has been shown to be effective at keeping sharks out of a delineated area. It holds great promise as a technology to promote beachgoer safety, without costing the lives of countless marine creatures.